1 1. Preheat oven to 350°. Combine artichokes, 1 cup Hellmann's® or Best Foods® Real Mayonnaise, cheese and garlic; set aside. 2. Cut bottom and top off red pepper; reserve bottom for garnish. Cut “hand” out of remaining red pepper; set aside. Finely chop 1/4 cup remaining red pepper scraps, then stir into Mayonnaise mixture. For “coffin“, cut 1-inch horizontal slice off top of bread; reserve. Remove inside of loaf, leaving 1/2-inch shell. Cut into bite-size pieces. 3. Pour dip into “coffin“. Top with bread slice, then wrap in aluminum foil. On baking sheet, arrange “coffin“. Bake 45 minutes or until heated through. 4. Meanwhile, on another baking sheet, bake bread pieces 12 minutes or until toasted. 5. Unwrap loaf and arrange on serving platter; remove lid. 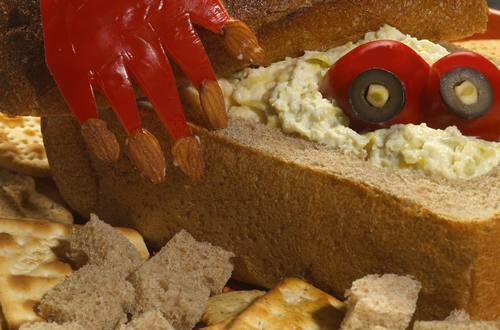 To assemble “coffin“, “glue” almond “fingernails” on “hand” using remaining 1 tablespoon Mayonnaise. Place “hand” in “coffin“. To make “peeping eyes“, cut 2 holes in reserved red pepper bottom and place halved olive, with piece of remaining garlic for “pupil” in holes. Prop “eyes” in “coffin”, then top with lid. Serve with toasted bread pieces and your favorite dippers.